Tswalu Kalahari Reserve is an exclusive private game reserve, the largest in South Africa, in the heart of malaria-free Northern Cape Province. An award-winning Relais & Chateaux safari experience and conservationists paradise, the combination of the Kalahari''s lure and the exquisite lodge style make this a truly spectacular safari destination. Appropriately, ‘Tswalu' means ‘'a new beginning'' in the Tswana language. The creation of this unique reserve has been a long labour of love with a clear mission to return the environment and game to its natural state and rid the area of any trace of the farming which once took place here. Founded in 1995 by British entrepreneur Stephen Boler, Tswalu Kalahari Reserve was acquired by the Oppenheimer family in 1999 following his tragic death. From that day, they have continued the drive to protect and conserve this ecologically fragile area. Today the reserve covers an area of approximately 1000 km² (100,000 hectares) and warmly welcomes the discerning safari-goer to experience its tremendous beauty. The native thornveld and russet sand dunes of the Kalahari are home to some of the world's most fascinating wildlife. Specifically adapted to their harsh environment, much of the game here is unlike anything visitors will have seen on other African adventures, making Tswalu a unique safari experience. Meerkats are a popular member of the habitat, with their curious stances, facial expressions and habituation making them ever-popular photographic models for admiring guests. Other species include black-maned lions, spotted hyenas, wild dog, tsessebe, red hartebeest, ostrich, giraffe, gemsbok, warthog, black-backed jackal, bat-eared foxes, white and black rhinoceros, cheetah, aardwolf, aardvark, red rock rabbit, scrub hare, porcupine and dassie. Birdlife is also well represented with more than 200 species of bird, some of them indigenous to the arid zone, found in the varying habitats in the reserve. Accommodation at Tswalu is equally memorable, with two separate lodge options. Motse is made up of eight individual suites made from desert sand and thatch, and accommodates up to 20 people, whilst Tarkuni has been designed for exclusive use, making it perfect for family or friends of up to ten people. Careful consideration for those who travel with children is clear in the design of the lodge, as well as the provision of children's entertainment and babysitters. At both locations, the crisp linens, sandy tones and immensely comfortable furnishings are blissfully mellow and relaxing. Dining and activities are arranged independently and offer tremendous flexibility. At Tarkuni, there is special children's accommodation comprising two sets of bunk beds, sleeping four children in total. An adjoining nanny's quarters comprises two single beds and an en-suite bathroom. Babysitting services are readily available. The Tswalu staff are on hand to entertain children by organising games such as mini-golf, archery, horse-riding, bouncing balls, chess, battleships and many more. Children will find this a wonderland. 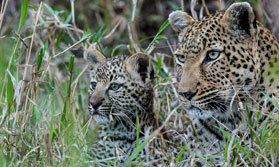 Families can enjoy doing many of the above activities together, as well as game drives with experienced guides, bush walks or an escape from the bush to play golf. Sundowners, stargazing, visits to archaeological sites in the Korannaberg mountains, and close-up meerkat watching for children over 6 years of age. Hot-air ballooning at dawn is magic, tracking rhino on foot exhilarating, sand- dune picnics divine and poolside massage a pampering pleasure. The dedicated team at Tswalu are passionate about guest enjoyment and make arrangements appear effortless. A visit to this very special part of Africa is a true indulgence on this Reserve. Location: Situated in Souther Africa's largest private game reserve, the Tswalu Kalahari Reserve. Rooms: The Motse is made up of 8 individual luxury suites and Tarkuni consists of 5 luxury suites for exclusive use. Activities: Game drives, guided bush walks, sleep-outs, balloon safaris, horse riding, donkey treks, rock art carvings and cultural visits, swimming and spa treatments. Facilities: The main house is large and open with elevated decks and elegent lounges. The infinity pool offers sweeping views of the savannah and a secluded spa for relaxtion and privacy. The library is equipped with a TV and the museum contains rare artefects from the area. Dining: Meals are served in the dining room, on your private deck or out in the bush. Children: The lodge welcomes children of all ages. Children need to be supervised at all times. Communication: There is limited mobile reception, a phone and fax at reception and complimentary internect access in the lounge. Experience the contrasts of city life, the desert and safari as you stay in style at specially selected luxury accommodation.